Have you started orthodontic treatment recently? Are you having a little trouble getting used to your braces? If so, you are not alone: Everybody goes through an adjustment period during which they momentarily wonder if they’ll really ever get used to this. Don’t worry — you will! And we’ve never heard anyone say, on the day their braces come off and their new smile is revealed, that they aren’t glad they went the distance. 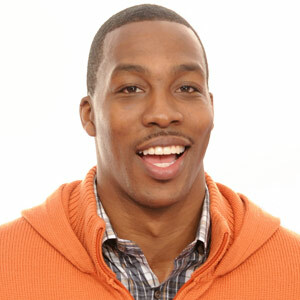 Just ask Houston Rockets all-star center Dwight Howard, who discussed his own orthodontic treatment in a recent interview. Hard & Chewy Foods: If you love fresh fruits and vegetables, that’s great; there’s no reason to give them up, just the really hard ones. You don’t want to bite into an apple or carrot or any other hard foods like bagels and pizza that have any “size” to them. Small pieces may be ok as long as they can’t bend your wires. Chewy, sticky candy should really be avoided completely. Same with soda, sports drinks and so-called energy drinks because they contain acids that promote tooth decay and can cause a lot of damage around the braces. Effective Oral Hygiene: Keeping your teeth clean is more important than ever, but also more challenging than ever. It’s easy for food to get stuck under wires and around brackets, but failing to remove it can cause tooth decay, gum irritation and soreness. Therefore, the cleaner your teeth and your braces are, the healthier you will be. Use interdental cleaning brushes and/or a floss-threader to get behind your wires. A mouthrinse can also help strengthen teeth and keep bacteria in check. If you have any questions about how to clean between your teeth, please ask for a demonstration at your next visit. Pain Relief: Some soreness at the beginning of orthodontic treatment is normal. To relieve it, you can use an over-the-counter pain reliever and/or a warm washcloth or heating pad placed on the outside of the jaw. If brackets or wires are rubbing against the inside of your cheeks or lips, try applying wax to these areas of your braces. If this does not offer enough relief, we may be able to trim the end of a poking wire. Call us if you need help with this.